Firstly, he can’t even get the name of the building that collapsed correct. It’s the CTV building, not the CCTV building. Secondly, and more importantly, you simply cannot exclude the CTV building. 115 people of the 185 people who died in the quake were in that building. A further 18 people were in the PGC building. Between those two buildings – one built in the 1980’s, the other in the 1960’s – more than 70% of the casualties occurred. If you choose to exclude the major part of the problem, then you have a different problem. You may come up with a valid response, but you are still ignoring the major underlying problem. I am grateful for the tireless campaigning of Anne Brower. The 15 year time frame to fix buildings was far too long, and I think that this timeframe makes much more sense. But what are we doing to ensure that more people don’t die as a result of badly built or badly engineered buildings in subsequent earthquakes? Old dungers are part of the problem, but not the largest part. For the government to go after one small but easily scapegoated type of buildings, whilst excluding the major problem, is a dereliction of responsibility. To put an MP who doesn’t even know the name of the bloody building in charge of the select committee is an insult. It depresses me to be writing this piece again. I thought we had put all of this to bed last year. Unfortunately, after the council suggested that the project was on hold, the opinion pages of the Press were once again filled will ill-informed pieces calling for the Town Hall to be pulled down. Then, some sanity. Former Arts Editor Chris Moore wrote this piece in last Friday’s art section, which summed up much of what I had been meaning to say. There’s a widely held misbelief that the cost of retaining the town hall will prevent the construction of a series of glittering arts palaces custom-made for individual organisations. But there’s no such thing as a free lunch … The sense of entitlement accompanying proposals for the arts precinct is mind-boggling. Some individuals and groups should remember that tooth fairies do not exist. Gerry’s opposition to the building is well known. We don’t know reasons for his stance; he may just hate brutalism, or internationally recognised architecture, or culture in general. The most likely reason is that he wants to knock down the Town Hall and take the insurance money, then spend it on the Performing Arts Precinct (PAP). Spending money on PAP gives him another opportunity to leave a lasting memory of his magnificence; the CCC voting to save the Town Hall means that he can’t. The PAP is weirdly considered to be a replacement for the Town Hall; it’s not. The Town Hall does play host to a lot of arts and cultural events, such as the orchestra, choirs, theatre and the like. But it is much more than that. It was often used for conferences, with the air bridge that linked it to the Convention Centre. It hosted speaking events; I remember seeing Robert Fisk speak in the Limes Room as part of the Writer’s Festival a few years back. It had a multitude of rooms, of a variety of sizes, that could be used by a whole range of people for whatever they might think of doing. The PAP doesn’t do that. What we’re seeing with the PAP is a bunch of very specialised cultural organisations within Christchurch seeing the dollar signs in Gerry’s eyes and putting their hand up for a bit of it. They think that if they play their part, and whinge about how awful the Town Hall was, then when the money starts flowing, it will come their way. It ain’t gonna work like that. There is a chance that if the CCC does knock down the Town Hall, they may just use the money to pay down debt. No one gets a building. The bizarre thing about this saga is how it has been reduced to a few voices from the arts community siding with Gerry against the Council and heritage advocates. If Gerry does win, and the Town Hall is knocked down for the benefit of a handful of commercial arts organisations, what does the council do without a Town Hall? I mean, we, as a city, are still going to have a Town Hall, right? They will have to find the money somewhere to build a new one. And no, an auditorium in a convention centre run by a casino doesn’t count. We are on the verge of losing the icon of our city – the Cathedral – and the symbol of our civic and cultural lives. 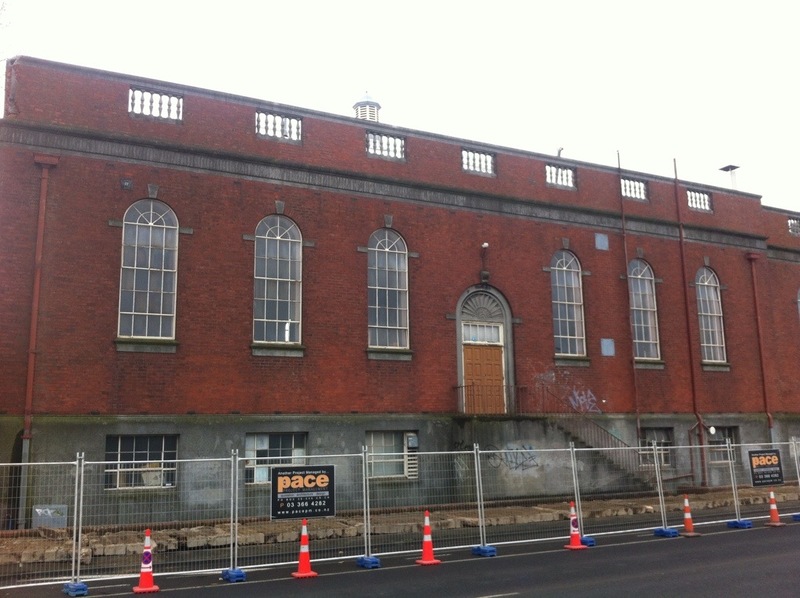 The people who came before us in Christchurch had the foresight to leave us with two fantastic buildings, and yet we are on the cusp of watching the last of our cultural history disappear because we left a philistine the keys to the bulldozer. 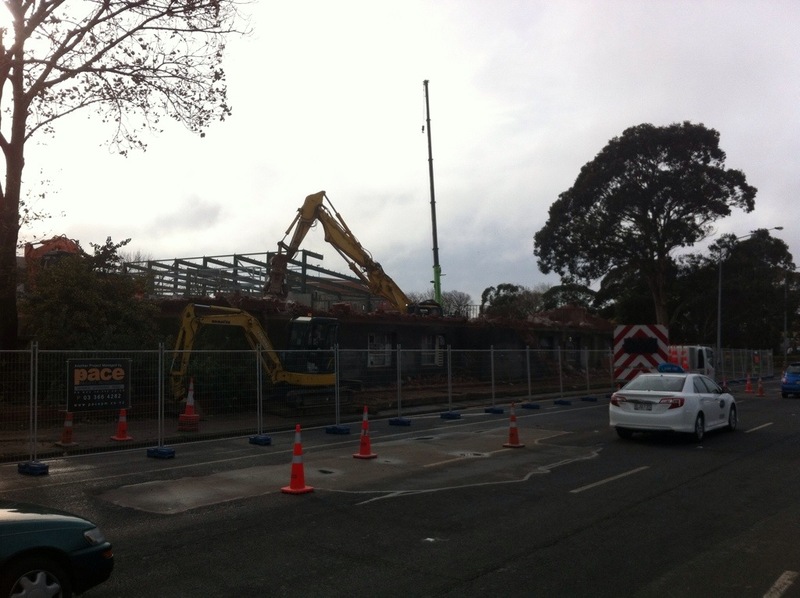 This is the CPIT War Memorial Hall at approximately 2:30pm yesterday. This building was of no immediate risk. It had been there since the quakes, not causing any harm. There was no need for the Section 38 powers to be invoked to demolish it. It is well beyond the time for these powers to be used. That the demolition was done overnight shows that the people responsible knew that this was something to be ashamed, hence doing their dirty work under the cover of darkness. It’s a disgrace. The picture of the ‘ruin’ that has been put on television and on the front page of the Christchurch Press on dozens if not hundreds of occasions is a totally false perspective of the damage that the Cathedral has suffered. 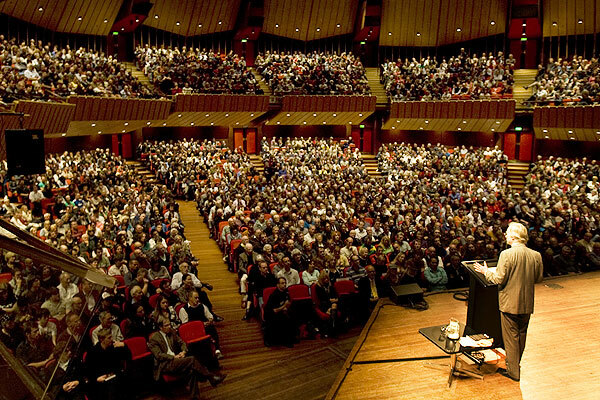 Some of the most experienced and knowledgeable seismic and structural engineers both in New Zealand and, internationally, agree that the Cathedral has not been terminally damaged and can be both made safe for repair and totally restored to the highest building code justifiably required for public buildings. No similar building in any other part of the world that I have experienced, would remotely be a candidate for demolition. I recommend reading it yourself. Labour’s policy announced last week was not one taken lightly; we recognise the significance of the Cathedral and the ownership of the Anglican Church. All that we have said is that if it is to be demolished, then it should not be under the provisions of the Section 38 powers. These powers were given to the government so that they could demolish buildings for public safety without going through an RMA process. More than 3 and a half years later, it is clear that the building provides no immediate hazard to the public. If the Church wants to demolish it, then they should have to go through the process of having it removed from the register of historic buildings. To do this would require a process under the RMA, in which all sides could present their cases. If the building is to come down, then so be it. But it should only be through a robust process, not the abuse of extraordinary powers. On Thursday, there was a very passionate, vocal protest to save the Majestic Theatre. Probably thanks to the presence of the Wizard, and two of his acolytes, it got good media attention – CTV news covers it here, and the Press has a video at the top of it’s piece as well. I gave a short speech in front of the Majestic, in which I covered off the main tenets of Those Left Standing: Repair, Reuse and Rethink. Repair. These buildings, still standing, clearly aren’t an immediate risk of falling down and causing harm to people. They can be repaired, if there is the will and the money to do so. Reuse. The rebuild thus far has been a huge waste – both of materials, and buildings. We need to ask ourselves where that mass of concrete, glass and steel will end up if we pull it down. We can reuse – by repairing buildings and putting them back into circulation, we can reclaim the built environment whilst protecting the natural one. Rethink. 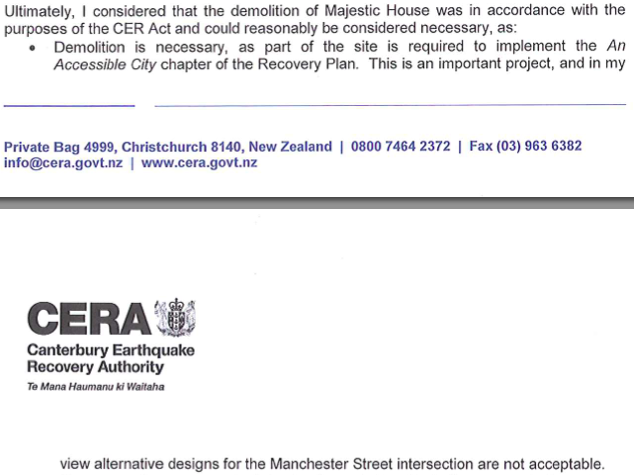 The CCDU want to pull down the Majestic Theatre to widen a road by 9m. 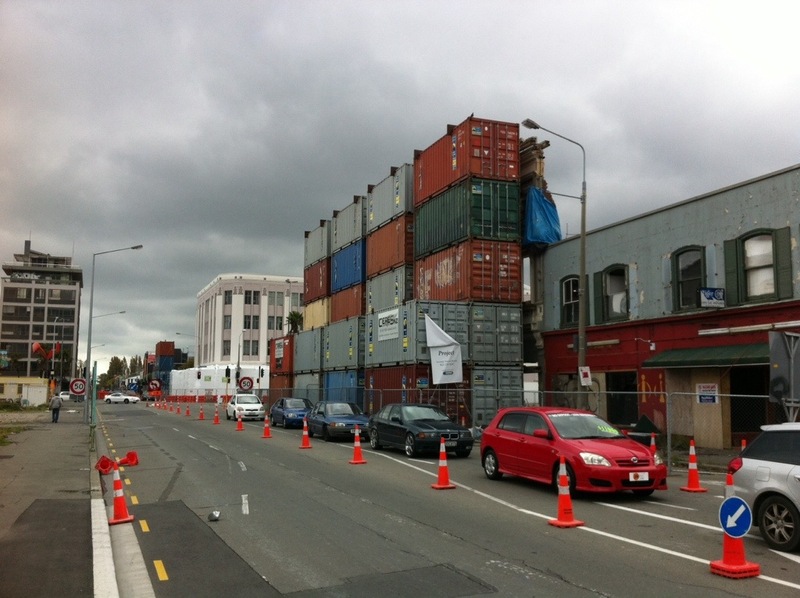 It’s 2014, and we’re knocking down buildings to accommodate more cars. This is madness, and shows that parts of the Blueprint plan need to be completely re-thought. Instead of reassessing how the plan has worked in the almost 2 years since it was released, Brownlee and Isaacs are doubling down on the Blueprint, betting that it’s failures can be glossed over by putting the house on red. It’s a high-risk play, with a potentially disastrous legacy if it all goes wrong. This is planning by bluster and stubbornness, and now is the time to admit that we need a rethink, before everything is bulldozed by an outdated plan. 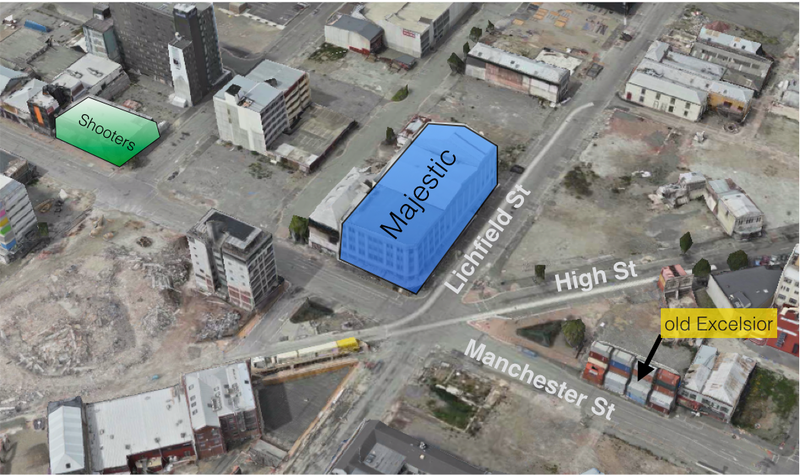 ATTENTION ALL MAJESTIC SUPPORTERS: We are planning a demonstration for THIS THURSDAY AT 1PM, in response to the news of CCDU’s decision to demolish the Majestic. 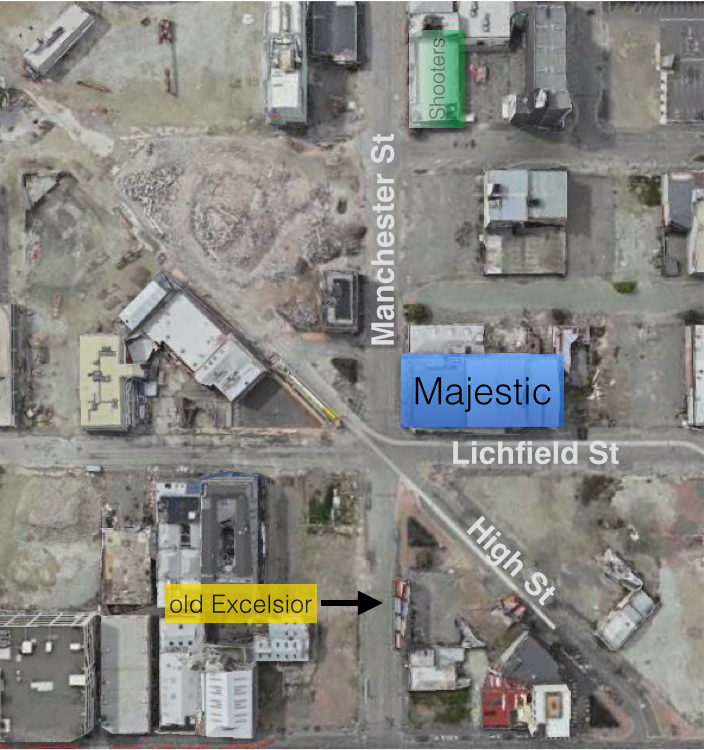 We will be stationing ourselves outside the Majestic Theatre, banners and placards in hand, ready to show that Christchurch wants to save the Majestic. Please come and show your support, your presence will make a huge impact, and spread the word as much as you can. 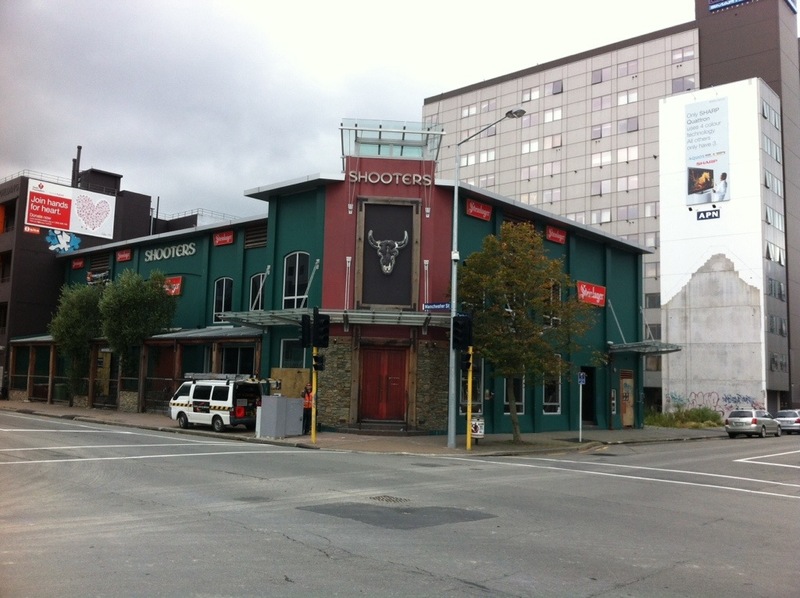 The more people we can get along on the day, the more we can show that we will not take this decision lying down, and that the Majestic needs to be saved for the benefit of Christchurch! More details to follow soon. Dr Ian Lochhead has written about the importance of the Majestic. Almost 50 years ago, on June the 27th, 1964, the Beatles played the last show of their one and only New Zealand tour at the Majestic. While “the Beatles played there” may not be the best excuse to save a building, it’s a million times better than “making the road 9m wider” – which is the reason being given to bowl the building. If you’re in the vicinity, I hope you’ll join me and others at the theatre, this Thursday at 1pm. Christ Church Cathedral speaks directly to us with an irreplaceable authority. It gives a voice to the remarkable historical and cultural movements that gave birth to its city and to Canterbury province. To lose this unique and singular voice would be a great loss, felt ever more acutely in the long term, which would prove detrimental to Christchurch. It should be spared from total demolition. My personal preference would be to see the Cathedral rebuilt on the current site, using the wooden frame that was initially proposed by George Gilbert Scott, then revived by Sir Miles Warren. This ticks all the boxes – sympathetic to the heritage of the building, a very reasonable cost, and seismic stability. 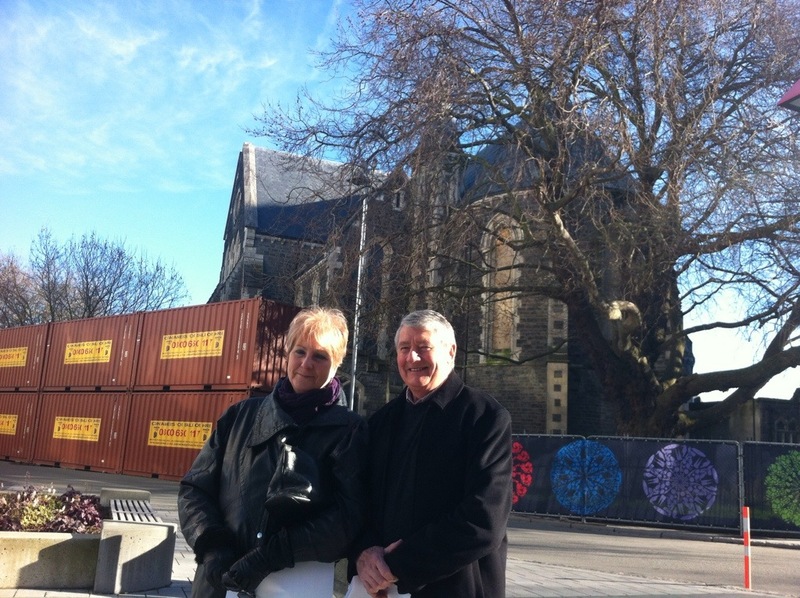 The Cathedral is the symbol of Christchurch, and if we don’t rebuild it, I think that says something very symbolic – and very sad – about the recovery as a whole.